Kidney transplantation is the best form of renal replacement therapy (RRT) for end-stage renal disease (ESRD) patients. In India, only 10% of ESRD patients receive any form of RRT and only 2% undergo renal transplantation. As per the Indian chronic kidney disease (CKD) registry, 39% of CKD Stage 5 patients were on RRT, of which only 2% were being worked up for renal transplantation. Deceased donor transplantation is still in its nascent stage, and despite ongoing efforts, it constitutes a small fraction of total transplants performed in our country. There is a significant demand and supply mismatch for living donor renal transplantation. To compound the problem, ABO incompatibility leads to rejection of almost 35% of the otherwise suitable donors. The published experience of ABO-incompatible (ABOi) renal transplant from India has been far and few. We hereby present our experience of initial fifty ABOi renal transplants. First ABOi renal transplant at our center was performed in November 2011. Since then, a total of 63 ABOi renal transplants have been performed so far. For analysis, only those patients who completed at least 6 months of follow-up were considered. There were fifty such patients. 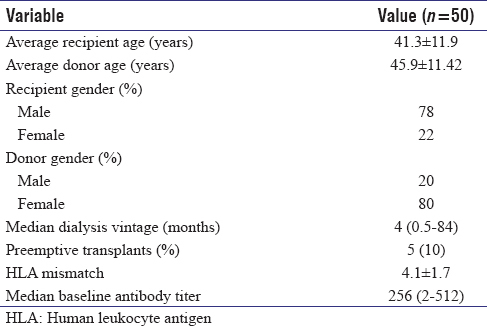 Antiblood group immunoglobulin G (IgG) antibody titers against donor ABO blood group antigen was measured in the recipient using column agglutination technology with Low-Ionic-Strength Saline-Indirect Antiglobulin Test Technique (Ortho-Clinical Diagnostics, Johnson, and Johnson, USA). The cassettes used were antihuman globulin type. This method, also known as the gel method, is known to be more sensitive than the tube test. Standard set of investigations was done for donor and recipient as per the protocol after a detailed history and physical examination. After completing the workup, complement-dependent cytotoxicity (CDC) and flow cytometry crossmatch were done before proceeding for preconditioning protocol. Preconditioning protocol consisted of intravenous (IV) rituximab (200 mg) administration 2 weeks pretransplant. A week after this, tacrolimus (0.05 mg/kg/day in two divided doses) and mycophenolate sodium (720 mg twice daily) were started, and the patient was admitted for isoagglutinin removal by cascade plasmapheresis. Target tacrolimus trough level was 8–12 ng/ml. On alternate day, cascade plasmapheresis (CP) was performed followed by administration of IV immunoglobulin (IVIG) (100 mg/kg/dose). Isoagglutinin IgG titer was monitored on daily basis and transplantation was done once the titer reached ≤8. Intraoperatively, IV methylprednisolone (500 mg) and basiliximab (20 mg) were given as induction. Another dose of basiliximab was repeated on the 4th postoperative day. IV hydrocortisone was given on the day of transplant followed by oral prednisolone at 40 mg/day next day onward. This was tapered to 20 mg/day on discharge. Daily monitoring of isoagglutinin titer was done till discharge and CP sessions were given in case of persistently rising titers. Patient follow-up was done twice weekly for the 1st month, weekly for the next 1 month, once in a fortnight till the 3rd month, and monthly thereafter for 1 year. After 1st year, follow-up was done once in 2–3 months. During every visit, renal function tests including serum creatinine and hemogram were monitored. Isoagglutinin titer was monitored twice weekly for 2 weeks postdischarge. Tacrolimus trough level target was 8–12 ng/ml during first 3 months, 5–8 ng/ml from 3 to 6 months, and <5 ng/ml thereafter. Prednisolone was tapered to 10 mg by the end of 3 months and 5 mg by the end of 6 months. Mycophenolate sodium was tapered to 360 mg twice daily by 6 months. Protocol graft biopsy at 3 months' posttransplant was done for initial nine ABOi renal transplant recipients. Later, it was discontinued due to unwillingness of the patients. Graft biopsies were also performed whenever indicated such as in case of rising serum creatinine. All the graft biopsies were examined by light microscopy and immunofluorescence including C4d. All rejections were biopsy proven. Statistical analysis was done using MedCalc for Windows, version 12.7.8 (MedCalc Software, Belgium). Data were reported as mean ± standard deviation values. As discussed, fifty patients who completed at least 6 months of follow-up were included for the final analysis. Median follow-up was 31 months (range, 8–38 months). [Table 1] shows baseline characteristics of the patients. 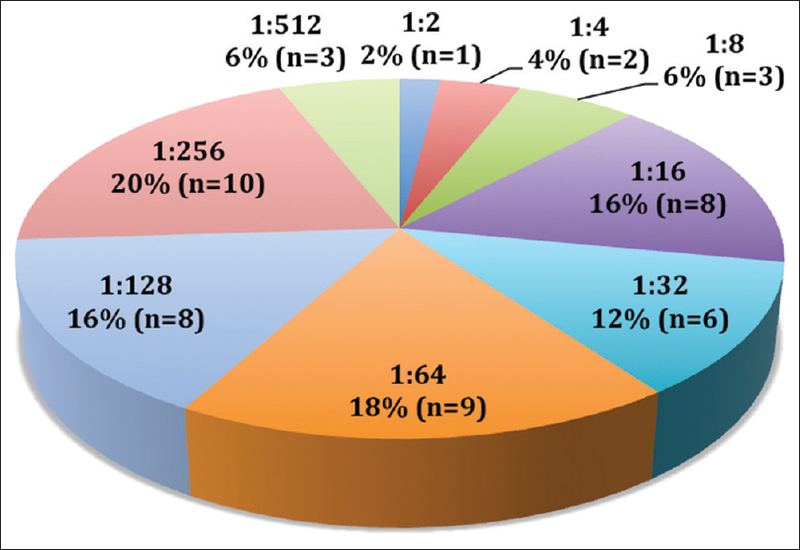 [Figure 1] shows blood group distribution of transplanted recipients and donors. Majority of the patients were O blood group recipients. [Figure 2] shows antibody titers of the recipients. Median antibody titer was 256. [Table 2] shows the patient outcome. Biopsy-proven acute rejection (BPAR) was 22% (n = 11). Four patients had acute antibody-mediated rejection within 24 h of transplant. None of these four grafts could be salvaged despite prompt plasma exchange. All of these acute antibody-mediated rejections showed prominent finding of thrombotic microangiopathy. There was no correlation between antibody titer and rejection. [Table 3] shows the cause of patient and graft loss. Infection was an important cause of patient loss. 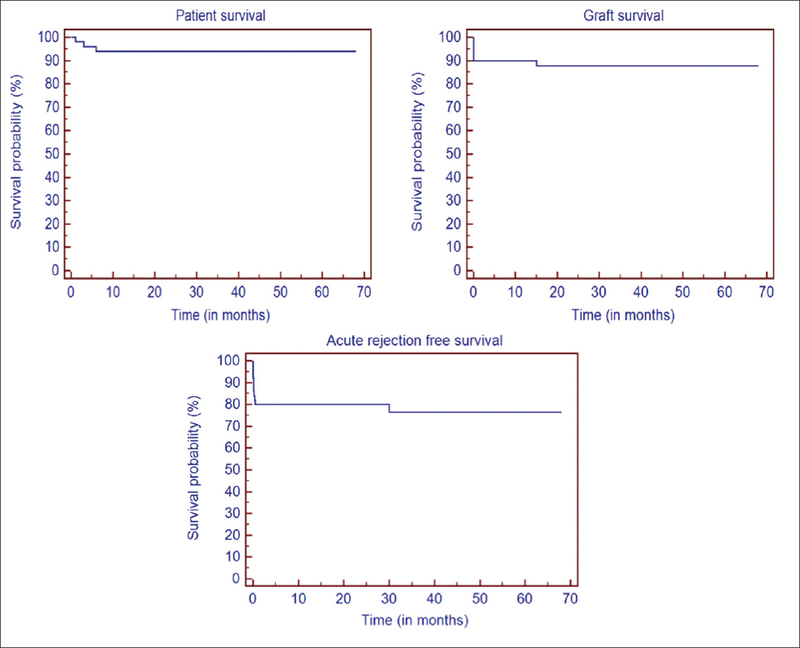 [Figure 3] shows the Kaplan–Meier curves for patient and graft survival and acute rejection-free survival. BPAR rate in ABOi recipients in the current study was 22%. This was better than the BPAR of 40% in a study by Wilpert et al. Lipshutz et al. and Uchida et al. reported BPAR of 11% and 32%, respectively., Most of the studies have reported 5%–33% incidence of antibody-mediated rejection (AMR) in ABOi recipients. In our study, 4 (8%) ABOi recipients developed AMR, leading to graft loss in all of them. Graft biopsies showed C4d staining in 64% of the cases. In various studies, C4d positivity in protocol graft biopsies has been seen in 80%–94% of patients and does not necessarily indicate AMR., In biopsies showing finding other than AMR, C4d was positive in 56% of the cases. The presence of C4d positivity in the presence of normal graft function and antiblood group antibodies in blood represents the phenomenon of accommodation. Infection rate was 22% in the present study. Infection was an important cause of mortality. Infection has been reported as the most common cause of death in previous studies as well., This appears to be because of higher immunosuppression burden due to preconditioning and efforts are ongoing to minimize immunosuppression by decreasing desensitization intensity and maintenance immunosuppression dosage in these patients. There are few limitations of the present study. This is a retrospective study. The follow-up of patients is relatively short. The sample size is small. Despite these limitations, this is one of the largest single-center experience of ABOi renal transplant from India. There are few unanswered questions in the field of ABOi transplant. There is a lack of controlled trials and which preconditioning protocol is the best is largely unknown. What dose of rituximab should be used? Should we use it at all as there are studies showing that ABOi transplants can be done even in its absence? What is the role and necessity of empirically administered postpheresis IVIG? What is the optimal immediate pretransplant antibody titer? What are the factors causing AMR in an ABOi transplant recipient? These are just a few out of the many unanswered questions in this ever-evolving field. 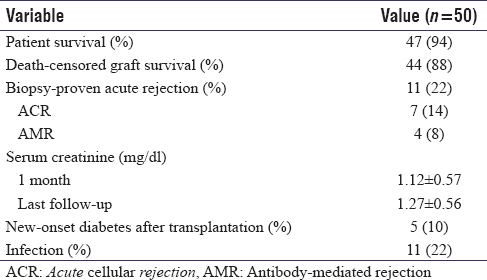 As noted in [Table 2], so far, 4 of our ABOi patients had AMR leading to graft loss. The antibody titer remained in acceptable range despite the rejection. Pretransplant CDC and flow cytometry crossmatch in all these patients was negative. Single-antigen bead assay to detect antihuman leukocyte antigen-antibody was done in three of these patients, but no donor-specific antibody could be detected. There are few published series of ABOi renal transplant from developing countries. Ours is the first series of fifty ABOi renal transplants. Although the rate of AMR was higher than those for ABO-compatible grafts, the graft and patient survival were good in the present study. BPAR was at par with others worldwide, and the rate of infection was also comparable with other studies. ABOi transplant rates should be encouraged to increase the scarce living donor pool. Segev DL, Gentry SE, Warren DS, Reeb B, Montgomery RA. Kidney paired donation and optimizing the use of live donor organs. JAMA 2005;293:1883-90. Hume DM, Merrill JP, Miller BF, Thorn GW. Experiences with renal homotransplantation in the human: Report of nine cases. J Clin Invest 1955;34:327-82. Starzl TE, Marchioro TL, Hermann G, Brittain RS, Waddell WR. Renal homografts in patients with major donor-recipient blood group incompatibilities. Surg Forum 1963;14:214-6. Dunea G, Nakamoto S, Straffon RA, Figueroa JE, Versaci AA, Shibagaki M, et al. Renal homotransplantation in 24 patients. Br Med J 1965;1:7-13. Alexandre GP, Squifflet JP, De Bruyère M, Latinne D, Reding R, Gianello P, et al. Present experiences in a series of 26 ABO-incompatible living donor renal allografts. Transplant Proc 1987;19:4538-42. Montgomery JR, Berger JC, Warren DS, James NT, Montgomery RA, Segev DL, et al. Outcomes of ABO-incompatible kidney transplantation in the United States. Transplantation 2012;93:603-9. Genberg H, Kumlien G, Wennberg L, Berg U, Tydén G. ABO-incompatible kidney transplantation using antigen-specific immunoadsorption and rituximab: A 3-year follow-up. Transplantation 2008;85:1745-54. Tanabe K. Japanese experience of ABO-incompatible living kidney transplantation. Transplantation 2007;84:S4-7. Tydén G, Donauer J, Wadström J, Kumlien G, Wilpert J, Nilsson T, et al. Implementation of a protocol for ABO-incompatible kidney transplantation – A three-center experience with 60 consecutive transplantations. Transplantation 2007;83:1153-5. Flint SM, Walker RG, Hogan C, Haeusler MN, Robertson A, Francis DM, et al. Successful ABO-incompatible kidney transplantation with antibody removal and standard immunosuppression. Am J Transplant 2011;11:1016-24. Lipshutz GS, McGuire S, Zhu Q, Ziman A, Davis R, Goldfinger D, et al. 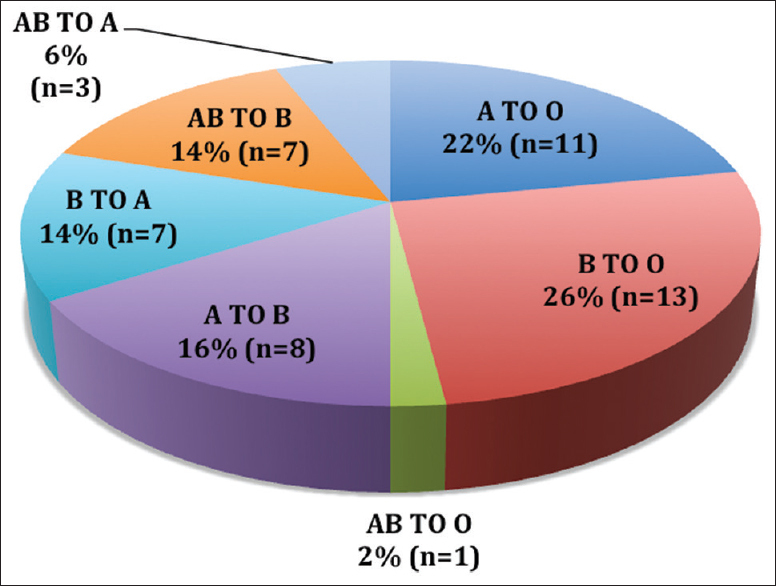 ABO blood type-incompatible kidney transplantation and access to organs. Arch Surg 2011;146:453-8. Pankhurst L, Hudson A, Mumford L, Willicombe M, Galliford J, Shaw O, et al. The UK national registry of ABO and HLA antibody incompatible renal transplantation: Pretransplant factors associated with outcome in 879 transplants. Transplant Direct 2017;3:e181. Wilpert J, Fischer KG, Pisarski P, Wiech T, Daskalakis M, Ziegler A, et al. Long-term outcome of ABO-incompatible living donor kidney transplantation based on antigen-specific desensitization. An observational comparative analysis. Nephrol Dial Transplant 2010;25:3778-86. Uchida J, Kuwabara N, Machida Y, Iwai T, Naganuma T, Kumada N, et al. Excellent outcomes of ABO-incompatible kidney transplantation: A single-center experience. Transplant Proc 2012;44:204-9. Setoguchi K, Ishida H, Shimmura H, Shimizu T, Shirakawa H, Omoto K, et al. Analysis of renal transplant protocol biopsies in ABO-incompatible kidney transplantation. Am J Transplant 2008;8:86-94. Haas M, Segev DL, Racusen LC, Bagnasco SM, Locke JE, Warren DS, et al. C4d deposition without rejection correlates with reduced early scarring in ABO-incompatible renal allografts. J Am Soc Nephrol 2009;20:197-204. Opelz G, Morath C, Süsal C, Tran TH, Zeier M, Döhler B, et al. Three-year outcomes following 1420 ABO-incompatible living-donor kidney transplants performed after ABO antibody reduction: Results from 101 centers. Transplantation 2015;99:400-4. Barnett AN, Manook M, Nagendran M, Kenchayikoppad S, Vaughan R, Dorling A, et al. Tailored desensitization strategies in ABO blood group antibody incompatible renal transplantation. Transpl Int 2014;27:187-96.